skewer through one rolled piece of prosciutto. Repeat. To finish the presentation, slide a cube of ciabatta bread, piercing through the crust, onto the end of the skewer. Repeat this procedure with all remaining ingredients. 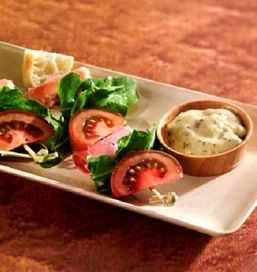 Serve the “BLT’s” arranged in wheel fashion around a bowl of prepared garlic aioli, using the aioli as a dip for the skewers. Cocktail picks are available in a variety of lengths. If a dainty appetizer is preferred, use a shorter pick and thread only one layer of ingredients on the skewer, then finish with the iabatta. Substitute fresh basil leaves for the arugula. Very thinly sliced smoked ham can be substituted for the prosciutto, rolling ham in the same manner. Pesto mayonnaise would make a great dipping sauce for this summer fresh appetizer.